The fully air-conditioned indoor facilities include 124 bedrooms, all with balcony and fully refurbished, 2 gastronomic restaurants, spacious lounges, a bar, a coffee lounge, a pool bar & restaurant, banquet and meeting facilities (20 - 400 persons) and two fully equipped conference halls (20 - 250 persons). 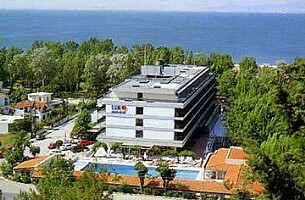 The Sun Beach hotel is near the picturesque fishing village of Agia Triada. If you just want to book this hotel and won't need the assistance of a professional travel agency click here for booking information, more photos and rates.